There are now TWO entry/exit points, with more staff on to help - which means less queueing and faster entry to the event! We've also allowed for better event flow and access to the stalls. Due to the number of visitors to the markets, we highly recommend using public transport. Royal Exhibition Building directions and how to get there guide is also available here. Tram: Tram 86 or 96 to Museum stop, corner of Nicholson and Gertrude Streets. City Circle Tram to corner of Victoria and Nicholson Streets. Train: City Loop train to Parliament Station. Bus: Bus routes 250, 251, 253, and 402 to Rathdowne Street. Taxi: Taxi drop-off zones on Nicholson and Rathdowne Streets. Parking is available via The Melbourne Museum which has a charge per hour. Spaces are limited and as a result we do recommend use of public transport. Please note: Melbourne Museum parking is operated entirely independently of the Finders Keepers markets. There are several ATM's available at the markets. Some stalls now accept debit / credit cards also, but we strongly suggest you organise cash to avoid any disappointment. 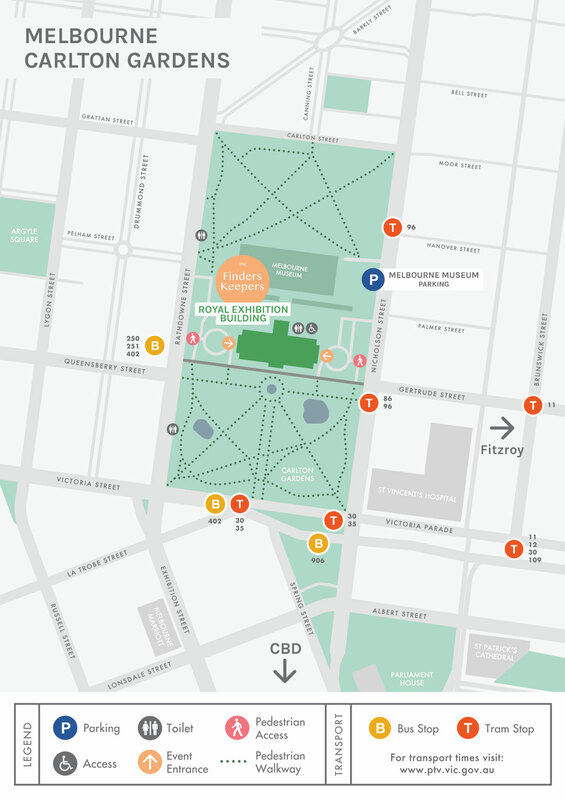 We have set up a parents room with lounges and a microwave to facilitate your parenting needs, located near to the Rathdowne Street end of the Royal Exhibition Building. (On the left as you enter the building from Rathdowne Street, or to the right as you face outwards towards Rathdowne Street). There are two main toilet facilities at the REB, one to the left as you enter from Nicholson Street, and another to the right as you enter from Rathdowne Street. On site first aid is available near to the Nicholson Street entrance of REB. If you or someone in your group requires emergency medical attention, please find your way to the first aid office, or please alert one of the Finders Keepers crew who will be able to assist. All areas of the building used by the markets, including toilet facilities, are accessible for wheelchairs.